The Land of Enchantment is known for its unbeatable cuisine, gorgeous high desert landscape and soulful culture. 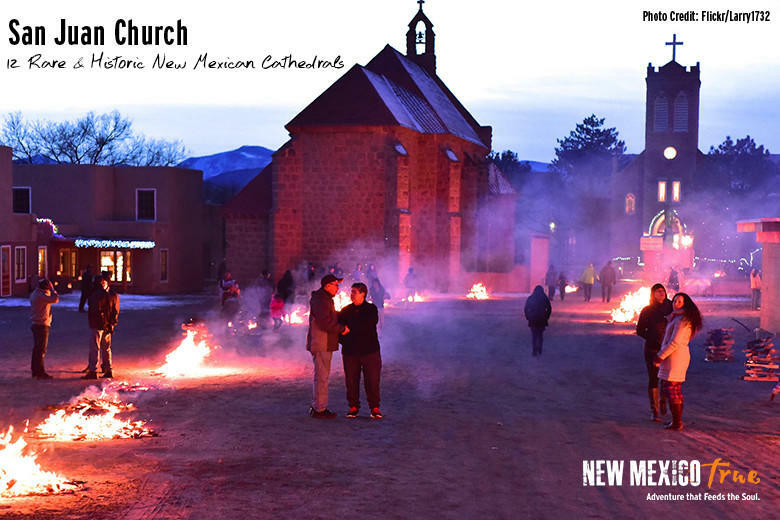 However, most people do not realize the state of New Mexico is also a mecca for iconic churches and cathedrals. In fact, it is filled with some of the most important and arresting historical structures in the country. Some of these buildings are so old that histories are strictly oral, causing inaccuracies and fuzzy dates. No matter what their exact origin, they are absolutely marvelous. So, if you are looking for a new adventure steeped in history and beauty, follow along on our tour of New Mexico’s great architectural works of art. What follows is a true adventure guaranteed to feed your soul. 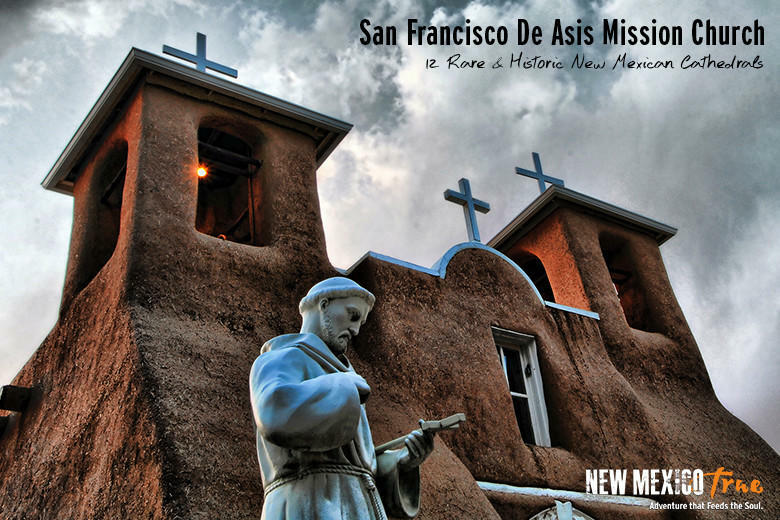 Located a few miles south of the Taos Pueblo in Ranchos De Taos is the majestic San Francisco De Asis. Though sources differ, most site this structure’s origination somewhere between the late 1700’s and early 1800’s. Its beauty has inspired artists for centuries. In fact, the sanctuary was made famous by Georgia O’Keefe, Ansel Adams and Paul Strand among many others. Georgia O’Keeffe described it as “one of the most beautiful buildings left in the United States by the early Spaniards.” If you are visiting during the spring try to coordinate with the “enjarre”, or re-mud. During this annual ritual the community gathers to help preserve their church by mudding a new layer of adobe on the walls with a mixture of mud and straw. 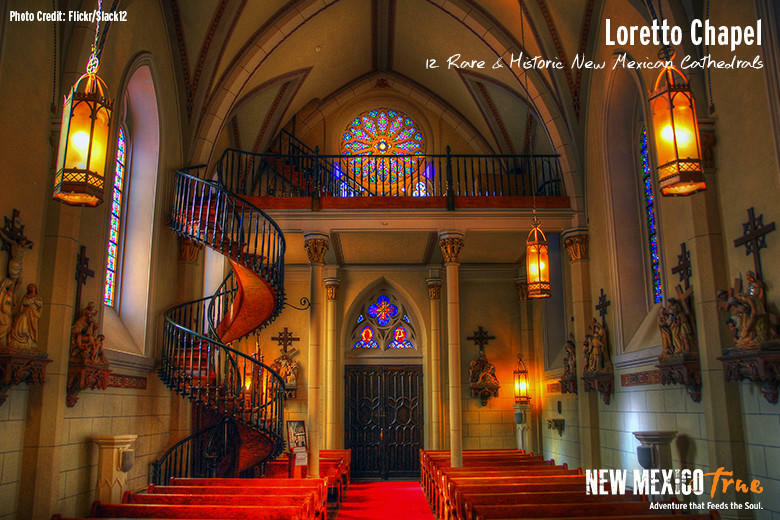 The Loretto Chapel in Santa Fe, once a Roman Catholic Church, is now used as a museum and wedding destination. This gorgeous chapel is steeped in lore and famous for its circular wooden staircase. Built by an unidentified man who showed up sometime between 1877 & 1881, his miraculous staircase has two 360-degree turns, no visible means of support, and wooden pegs instead of metal nails. The faithful believe that the mystery man was St. Joseph himself. If you like firsts, then this church is worth a visit. 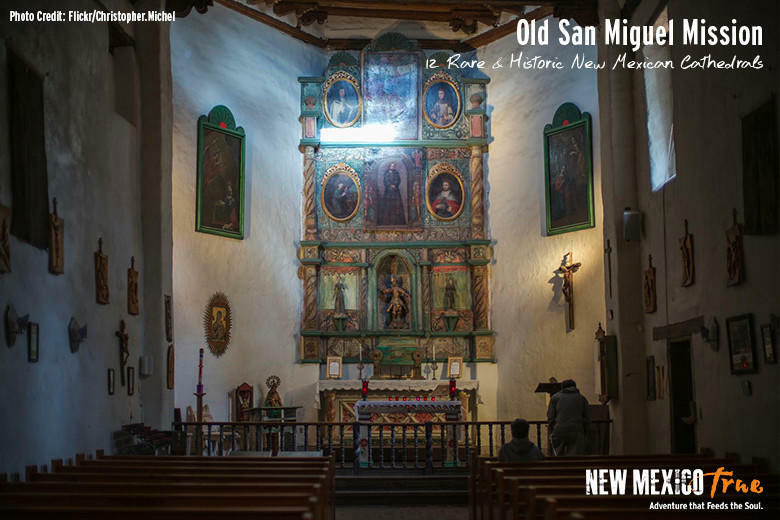 Said to be the first Catholic church built in the continental U.S., the San Miguel Mission was built somewhere between 1610 and 1628. The modest adobe structure sits next to a local pizza parlor in Santa Fe. However, the walls and interior are rich with its history and unassuming beauty. The chapel is still open during most of the week for prayer and visitors. 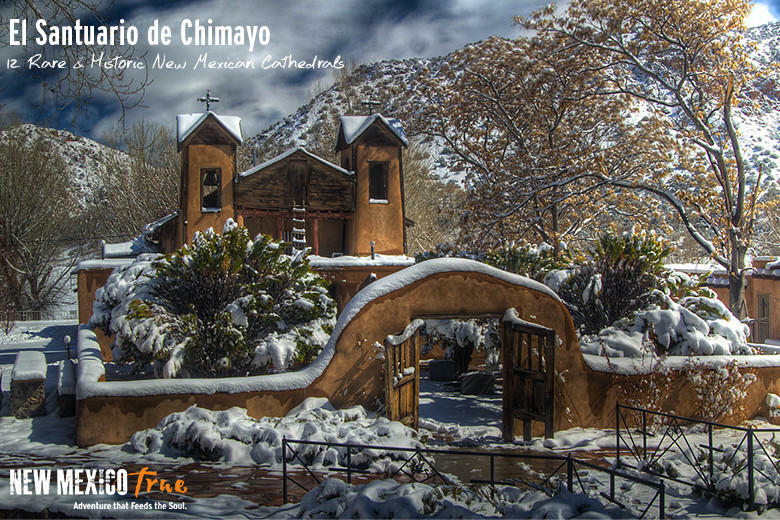 Nestled in the village of Chimayo along the High Road to Taos sits a national historic landmark, El Santuario de Chimayo. The sanctuary is notorious for the unusual legend of its creation and as a present-day pilgrimage site. It receives almost 300,000 visitors per yearand has been called "no doubt the most important Catholic pilgrimage center in the United States.” It is also often called the “Lourdes of America” for it’s magical healing soil. In the small prayer room next to the sanctuary is a round hole filled with this soil. In fact, many come to the church in pursuit of this soil, hoping to find a cure for their afflictions. 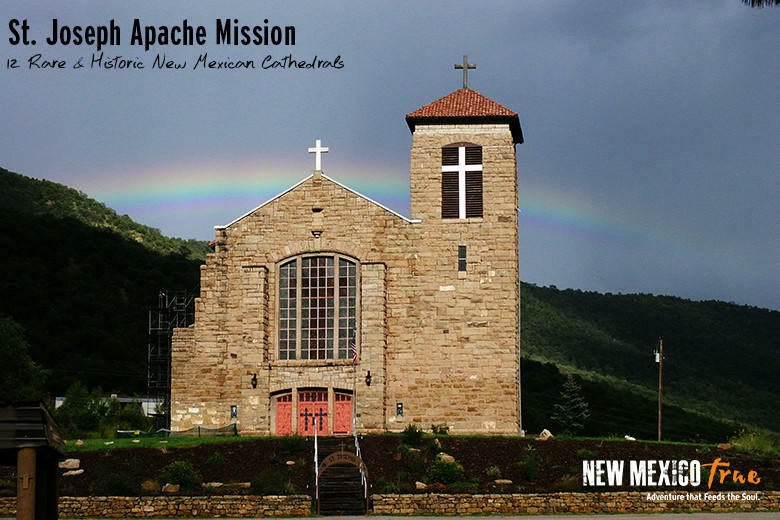 St. Joseph Apache Mission church is nestled in the heart of the Sacramento Mountains on the Mescalero Apache Reservation. 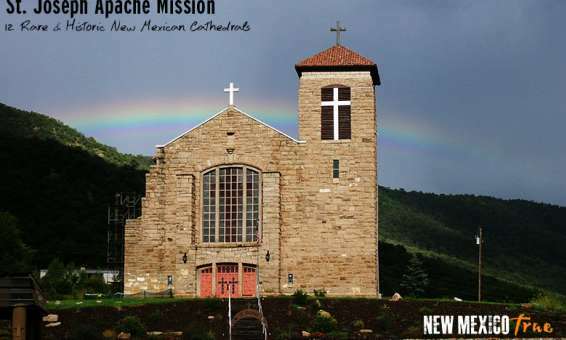 The church, built for the people of the reservation, has the Apache culture woven throughout its striking neo-Gothic structure and services. During Mass, Apache drummers perform and the ceremony is observed in their Native language. The church has also been dedicated as a memorial to veterans who gave their lives in World War I and II. 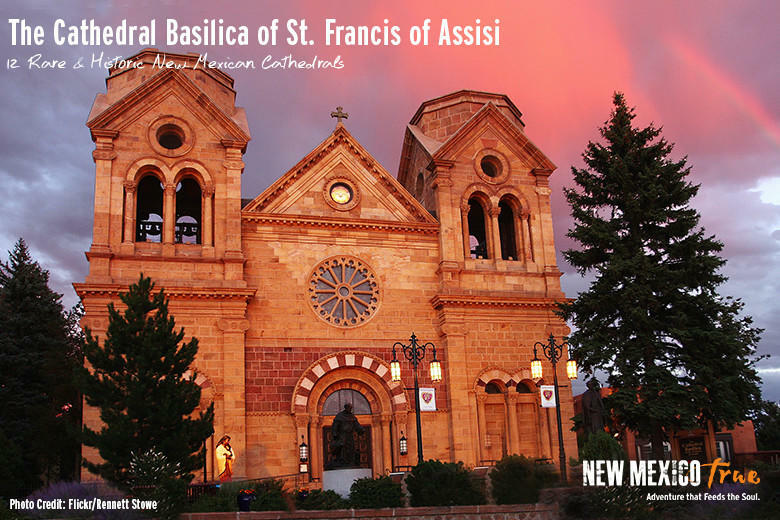 The first Catholic Church built in the U.S. resides in New Mexico in Santa Fe, The Old San Miguel. 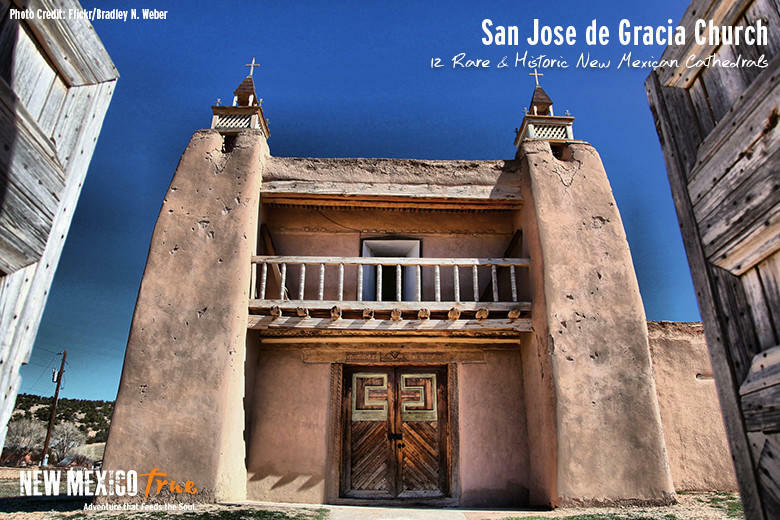 A lesser-known fact is that the first and oldest parish in the United States is also in New Mexico, the San Juan Bautista. The parish on an Indian Pueblo called Ohkay Owingeh, about 35 miles north of Santa Fe. Today the parish is still thriving. The average Sunday mass is attendance is over 1200 people. If you plan to attend, go early to reserve a seat. The San Geronimo Chapel is positioned near the entrance of Taos Pueblo, one of the longest continually inhabited communities in America (1000 years). The present day church was built in 1850. However, ruins from the original structure, built around 1619, remain lending the chapel quite a bit of history and charm. Visiting the pueblo and accompanying chapel has been heralded as one of the best Native American experiences in the United States. 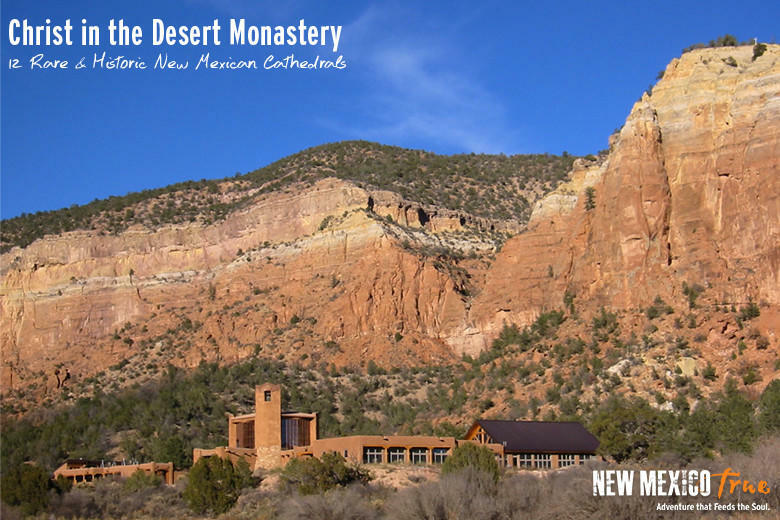 The Monastery of Christ in the Desert was founded in 1964 and is situated in a beautiful canyon in northwestern New Mexico, surrounded by miles of government-protected wilderness. The monks of this monastery are part of the 1,500-year tradition of Benedictine monasticism. If you are seeking endless peace and serenity, look no further. 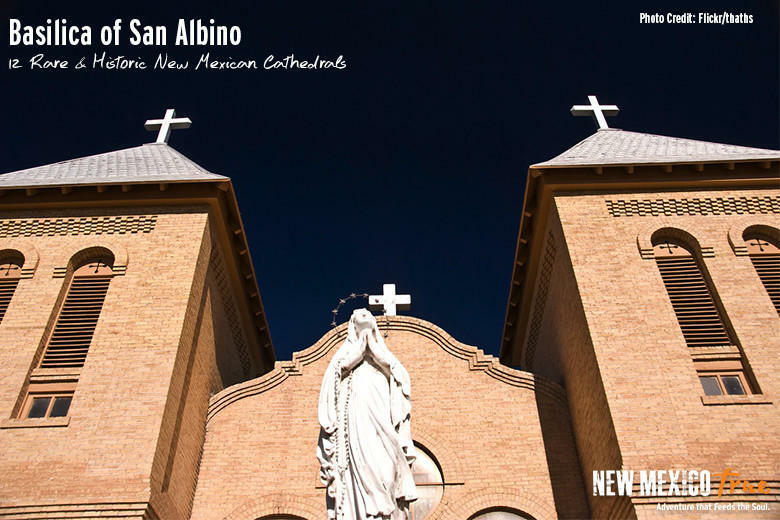 San Albino is one of the oldest missions in the Mesilla Valley. It was established by order of the Mexican government in 1851 and carries a unique historical and geographic lineage. The mission was originally established in Mexico, but it is now located in the United States as a result of a transfer of territory in the Gadsden Purchase. This cherished landmark attracts international attention and visitors. If you plan on visiting make sure to stop by the history room – a little museum packed with eclectic artifacts and treasures. Some of the items in that little room date back to before the church was built. 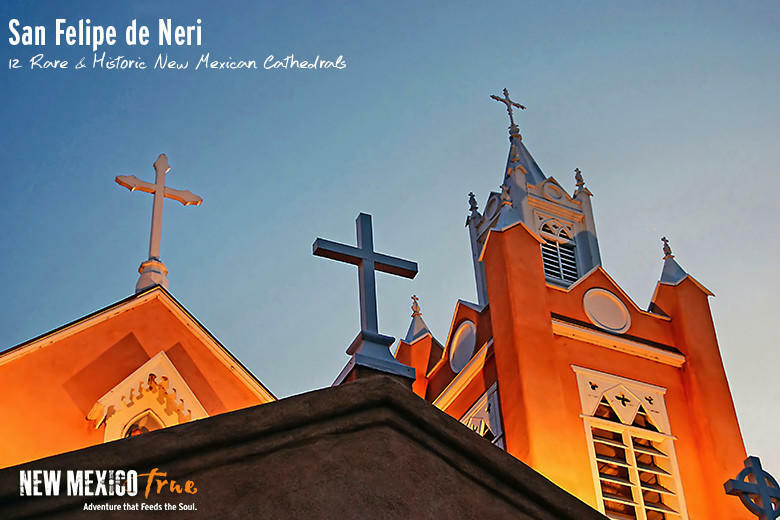 San Felipe de Neri Church is one of the oldest surviving buildings in the city of Albuquerque. The existing church was built in 1793, though original structure was built in 1706. It is located on the north side of Old Town Plaza in the heart of the city. The original church was started in 1706, but collapsed in 1792 during a very rainy summer. The current structure was built the following year. A beautiful Mass is still held every Sunday. This church, built between 1760 and 1776 is the hallmark of Las Trampas, New Mexico. 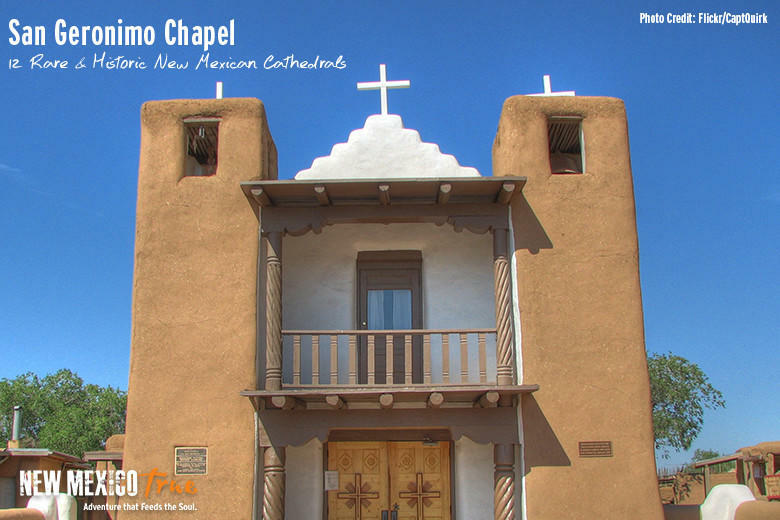 It is acclaimed as a model of the adobe architecture found throughout the state and one of the best-preserved examples of Spanish Colonial churches found in New Mexico. The church was designated a National Historic Landmark in 1970.